Friends, most of you know the basic story of our congregation’s founding. You know that services were first held in the Sherman home in 1896 and the first High Holidays that same year were held in the Husler Building, now owned by the Historical Society of Carnegie. You may not know that our congregation was officially chartered in the Allegheny County Court of Common Pleas in 1903. To celebrate the 50th anniversary of that charter, the congregation held a celebratory dinner. I have attached the program booklet from that affair. It is quite a fascinating look at our past. Click HERE. Not only can we reminisce about the businesses on Main St. where we used to shop or eat lunch, we get to see a lot of names and faces of past friends and family. One of the things that caught my attention was that women didn’t appear to have first names back then. They were Mrs. Irving Bendis or Mrs. Bernie Roth. Times have changed and that’s part of the joy of looking at historical documents. Thanks to my daughter Melissa for scanning this document into the computer. Feel free to share with others in the community who may be interested in Carnegie history. PS. The shul president at the time of the original charter in 1903 was Falk Kantor. There’s a lot of history to be told about Mr. Kantor. Last year I met with his great granddaughter, Florence Bebo. I will be posting a lengthy story about the Kantors this summer. It’s going to take me a while to assemble all the story which has connections to Liverpool, England, Washington DC, Beaver Falls, PA and our home town of Carnegie. Fascinating! What a thriving era to remember in Carnegie. All those names are ones I’d heard from my parents. Interesting that the Shul had a different entrance, with the steps outside, and now they are enclosed. Wow! I am envious of all those sponsors in the program. Carnegie was a thriving town indeed. And I appreciate your “feminisist” comment on women without first names. The little girls had them! I always love reading about the history of Ahavath Achim. I save these stories so they can be read and reread. I was always cognizant of women’s names missing from flyers, invitations, and notices. It bothered me because I never knew their first names when addressing them. I had to call them Mrs. So and So because it was embarrassing to not know their names. 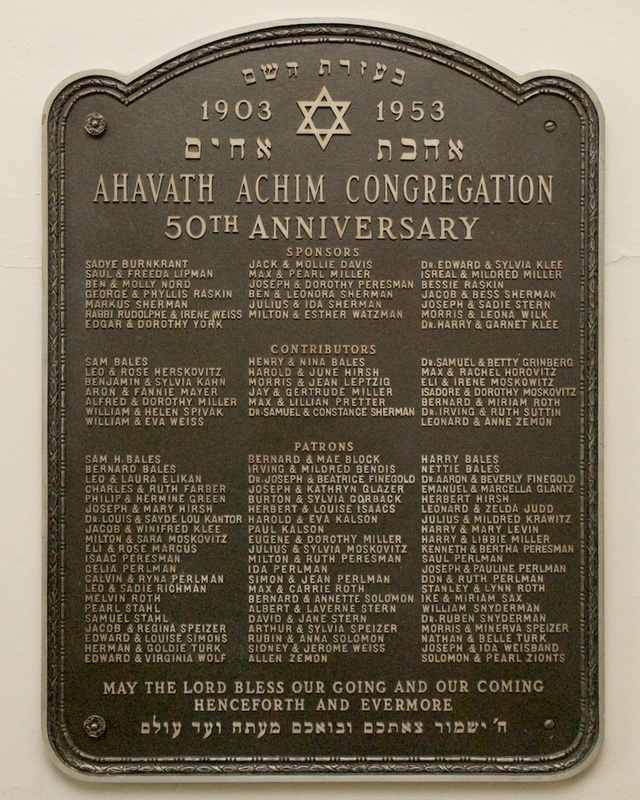 It was great reading all about the history of Ahavath Achim and seeing old pictures of my Uncle’s Morris Wilk and Paul Kalson and also a very old picture of me with the Cheder class. It brought back a lot of memories of growing up in Carnegie.